There are two topics that come up time and again in old GamesIndustry.biz stories that I just don't see nearly as much of these days: Used games and piracy. What's particularly interesting to me is that those were two subjects the industry was by and large willing to take a stand on even though it risked putting them at odds with significant segments of their customer base. For instance, Nintendo of America president Reggie Fils-Aime had no qualms about arguing in public that the existence of used games was not in the customer's best interests. "Used books have never taken off. You don't see businesses selling used music CDs or used DVDs"
"Describe another form of entertainment that has a vibrant used goods market. Used books have never taken off. You don't see businesses selling used music CDs or used DVDs. Why? The consumer likes having a brand-new experience and reliving it over and over again. If you create the right type of experience, that also happens in videogames." Setting aside that Fils-Aime was apparently ignorant of the plethora of local and regional chains of used book, CD, and movie stores that had been doing just fine at the time, he never actually explained how getting that "right type of experience" for less money was not in the customer's best interests. Or how it benefitted customers to pay $60 for a new game, find out they don't like it, and have no way to recoup even a penny of that money back. He just said some nonsense that would no doubt anger a portion of Nintendo's fan base because he thought used games were cutting into the company's profits. At least with the industry's fight over piracy, there were actual laws being broken. Some of those laws were even being enforced. A couple weeks after Fils-Aime's statement, the founders of The Pirate Bay torrent site were given a stiff fine and sentenced to a year in prison. And while every downloaded copy of a game by no means equates to a lost sale, it's equally absurd to suggest that no person willing to buy a game ever just pirated it to save a few bucks. "I'm convinced and we're convinced that piracy has taken out a big chunk of our software sales on PSP," Sony Computer Entertainment America senior VP of marketing Peter Dille said in an April 2009 interview, adding, "It's not good for us, but it's not good for the development community. We can look at data from BitTorrent sites from the day Resistance: Retribution goes on sale and see how many copies are being downloaded illegally, and it's frankly sickening." At the same time, you can see the thinking around the industry changing on these topics. Veteran developer David Perry had concluded the piracy battle was impossible to win, and as a result was pursuing two ventures that could sidestep that battle: free-to-play games (Acclaim) and cloud gaming (Gaikai). While the world today is lousy with free-to-play money makers and cloud gaming is still a largely speculative investment, Gaikai would be Perry's better bet from a decade ago. Acclaim was acquired by Playdom in 2010 and shut down just three months later. On the other hand, Gaikai was acquired by Sony in 2012 for $380 million and served as the backbone for PlayStation Now streaming service. "You like to think you make compulsive game experiences and people won't want to trade them in, but that's their perfect right"
Traditional publishers were similarly eager for new business models to box out pirates and second-hand sales. In explaining his own company's interest in cloud gaming, 2K Games president Christoph Hartmann said, "What we think the future will be is the market will shift to more server-based games - similar to the movie business where most people just rent instead of view films in the cinema." That prediction was already being proven out, as just a couple weeks earlier the original FIFA Ultimate Team mode launched in FIFA 09. And lest anyone think it was coincidental how these new business models let companies get money from people who otherwise would have been able to play a game without giving them a dime, EA Sports president Peter Moore was busy spelling it out. "You like to think you make compulsive game experiences and people won't want to trade them in, but that's their perfect right," said Moore, with a word choice that might explain the current fight over loot boxes and gaming addiction. "What we have to do as publishers is find ways of taking advantage of that. How do we monetize that second-sale consumer? I think online is the key to that, and finding ways of innovating with that consumer, because they still log on, and we get access to them, so how do we sell them stuff?" The Division 2 just launched and much of the discourse surrounding it is about how Ubisoft is insisting the game is apolitical when it is very clearly mashing all the politics buttons like a toddler at an arcade game playing the "Insert Coin" screen. As anyone who's been following games for a minute knows, this is the "quarter in your ear" of incredibly disingenuous marketing slight of hand. Ubisoft does it particularly well (see: Watch Dogs, Far Cry 5, that one game where you assassinate the freaking pope…) but it is hardly an Ubisoft exclusive. There was the Infamous: Second Son E3 reveal, the Call of Duty: Modern Warfare 2 "No Russian" mission that encouraged players to go on a shooting spree in an airport, and countless others. "Partnering with over three dozen US Marines to help develop the game along with unprecedented access to battle plans, after action reports, photos, videos and satellite maps makes this game the most authentic military shooter to date," Konami proclaimed in the press release. "Coupled with missions, objectives and scenarios grounded in factual events, Six Days in Fallujah will create an authentic 3rd person shooter unlike any ever developed." "We're not trying to make people feel uncomfortable... At the end of the day, it's just a game"
Given the ongoing nature of the war, the real-life setting, and the game industry's reputation/track record on violence, some people weren't cool with this, and understandably so. In trying to make the angry people go away, Konami VP of marketing Anthony Crouts reassured the Wall Street Journal that the company was "not trying to make a social commentary." "We're not pro-war," Crouts said. "We're not trying to make people feel uncomfortable. We just want to bring a compelling entertainment experience... At the end of the day, it's just a game." Our own Rob Fahey was among the people who called bull on that one, and he would not be alone. Seeing the backlash and wanting precisely none of it, Konami dropped the game less than two weeks after announcing it. Shortly afterward, Atomic Games CEO Peter Tamte said development on Six Days in Fallujah continued, and defended the game in a keynote address at the Triangle Game Conference in North Carolina. "After they got back from Fallujah, these Marines asked us to tell their story," Tamte said. "They asked us to tell their story through the most relevant medium of the day - a medium they use the most - and that is the video game." Tamte couldn't get another publisher to pick up Six Days in Fallujah, even though his argument was apparently persuasive to Electronic Arts. 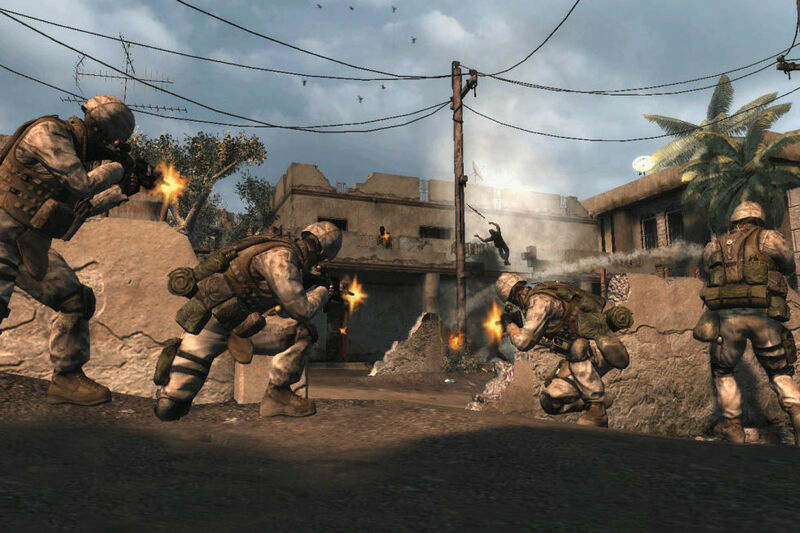 When EA announced its new Afghanistan-set Medal of Honor game later in 2009, EA LA VP Sean Decker closely echoed Tamte's spin, saying, "EA has always been an advocate for telling the soldiers' story. The new Medal of Honor follows that tradition. We felt it was important to tell the story of today's war and today's elite soldiers via today's most relevant medium - video games." Here's a fun fact. While the bullet points usually get buried at the end of the article, they're often the first thing I actually write because they're the most fun. So in light of a particularly strong month of regrettable utterances, karmic retribution, and the obligatory bitter snark over the PlayStation Vita, here's a rapid-fire rundown of stuff that happened in April of 2009, slightly higher in the column than usual. ● In an interview with GamesIndustry.biz Lionhead's Peter Molyneux talked about how the company's professionalism enabled it to survive a recent round of job cuts at parent company Microsoft. Days later, Microsoft paid a settlement to a Lionhead developer for homophobic abuse he suffered at the studio. ● The best Grand Theft Auto game ever, Grand Theft Auto: Chinatown Wars on the DS, sold just 89,000 units in the US during its launch month, falling far short of analyst expectations. Nintendo of America VP of licensing Steve Singer then made the curious choice to spin the news by essentially saying, "Nah, those numbers are pretty normal for third-party AAA games on the DS." ● Sony exec John Koller took a swipe at Nintendo for ignoring "significant gamer demographic groups" with the recently launched DSi. Years later, Sony would actually adopt Nintendo's successful DSi strategy for its next handheld, the PlayStation Vita. Unfortunately in that instance, the significant gamer demographic group Sony chose to ignore with was "Vita owners." ● Music games are not a fad, insisted the co-founder of a company instrumental in the creation of the fad as well as its subsequent saturation and dissipation. ● Following Gears of War 2 producer Rod Ferguson's horrifying endorsement of crunch even for developers who are on schedule from the month prior, Epic Games' Mike Capps defends the studio's work culture, saying developers are always sent home at 2 a.m., a rule that is strictly enforced, even during crunch. ● Take-Two shares surged on rumors of an imminent acquisition that turned out to be entirely bogus. It wouldn't be the last time. Or even the second-to-last time. ● Slither director James Gunn publicly dragged Microsoft for censoring his contributions to an Xbox Live Horror Goes Comedy series of short films. "People didn't want to see our shows, which were barely a half-step removed from something you'd see on the Disney Channel," Gunn said at the time. The director would later whistle a different tune about Disney-esque content oversight as he directed a pair of Guardians of the Galaxy movies for Disney and Marvel. Ah well, everybody's probably said something from a decade ago they kinda regret, right? ● Former Infinium Labs boss Kevin Bachus said the much-mocked Phantom "console" -- basically a PC that would connect to the TV and could only get games through digital distribution -- was ahead of its time, proving that it's one thing to correctly guess the future and a different, more difficult thing to actually build a business off of that guess. ● Speaking of digital distribution ahead of its time, the first details for the UMD-less PSP Go leaked early. Just in case Sony didn't enjoy that enough, the next month saw the entire E3 reveal for the hardware leak out days ahead of Sony's E3 conference. ● 10 years ago, Bethesda was considering filing a lawsuit over a Fallout MMO. The shoe's on the other foot now, I guess. ● If you're wondering why the industry is in such a fight over gaming addiction these days, I would suggest it hasn't helped that its response to the idea has consistently been aggression and hostility rather than honest reflection or an interest in the well-being of its customers. ● Here's ngmoco founder Neil Young warning that publishers who choose greed over gameplay and turn their low-cost mobile games into money traps will alienate customers and fail financially. We were so naïve back then, so innocent. ● Crush Digital Media went bankrupt and laid off all its employees after just two years. From what I can tell, its only two games -- Blend-it and Salon Superstar on the DS -- would be released posthumously. ● Retailers were feeling the pinch with US software and hardware sales down, GAME implementing a wage freeze, and Best Buy looking to cut wages and staff. ● THQ laid off devs at Big Huge Games as if to put an exclamation point on previous reports that it wanted to sell the studio. ● Microsoft quarterly revenues were down year-over-year for the first time ever. ● "Developer not dead yet" is considered headline-worthy news.